If you are travelling from outside of the capital to see a show in London it is very easy to get about London by public transport. All the mainline stations are also served adequately by the London Underground and all of the theatres have tube station close by. Take a look at our venue information pages for detailed information on each theatre. Here, you’ll find details on the specific tube station which is nearest to each of the shows, as well walking directions. Of course, if you have a smart phone, you can also simply enter the post code for the theatre, and your device will lead the way! The majority of theatres in the heart of theatreland are served by Piccadilly Circus, on the Piccadilly (royal blue) and Bakerloo (brown) lines, or Leicester Square also on the Piccadilly line and the Northern (black) line or Covent Garden on the Piccadilly line. Oxford Circus on the Central (red), Bakerloo (brown) and Victoria (light blue) lines is closest to the London Palladium. Victoria on the Victoria (light blue), Circle (yellow) and District (green) lines is closest for both the Victoria Palace theatre and Apollo Victoria theatre. Many people enquire about catching the tube after their evening show. 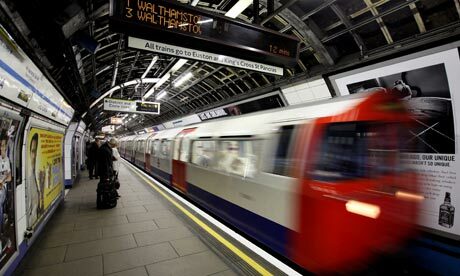 London Underground lines continues to run until midnight (and later at the weekends) so there is no danger of missing your train after the show, as most will have finished by 10.30 p.m. or 22.30 if you are more familiar with the 24 hour clock. Sharing a taxi to the theatre venue can sometimes represent a cost effective way of getting there depending on how many of you there are. It has even been known where a stretch limo taking twelve can be less expensive than rail travel but it obviously it depends on distances and where you are coming from. Getting a taxi after a show can sometimes be a challenge, so if possible pre-book your cab. It becomes even more of a challenge when it is raining as all the theatres are emptying at similar times and it seems everyone wants a cab. My tip is to take the tube, at least that way you are guaranteed to reach your destination in time, especially if you need to get a mainline train to continue your journey. Obviously, it is unwise to take an unlicensed mini-cab and you are definitely taking your life in your hands if you are seduced in to a rickshaw. They are distinctly unsafe. It is always best to arm yourself with a tube map as they are not always prominently displayed at some stations and in the event of tube cancellations or delays you can instantly work out an alternative route. If you are relying solely on the tube map some distances between stations can be misleading, and if the weather is fine it is often better to walk. For instance by the time you disappear down the labyrinth of tunnels in Leicester Square then back up again at Covent Garden, you will find there are no escalators at Covent Garden, so it is either a wait for the lifts which are often congested or a long climb up the stairs. Better and quicker to walk, and on-the-whole much more healthy. And whilst some stations, such as Covent Garden are technically close to theatres such as the Lyceum theatre, if it is more convenient to go to Charing Cross or the Embankment it is just as easy to walk along the Strand to Covent Garden. Covent Garden is a great destination to go pre-theatre to sample the buzz of London, some great individual shops all around Covent Garden, the indoor market and the warren of streets surrounding the plaza are an interesting place to explore. There are cafes, bars and restaurants in abundance, as well as a whole host of interesting street entertainers. This is a real man, who somehow manages to balance himself in this position on one leg for hours on end. Just how does he do it? There are no hidden strings or glass seats, I can assure you, I have studied him and walked around curiously. Baffling!